We always had a piano in the house, even before we had a TV. 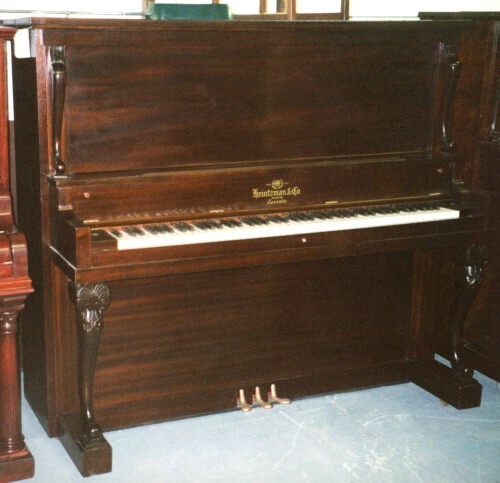 While I never really learned to play more than a few clumsy chords on it or pick out a few simple tunes, I grew to love music listening to my dad play swing and boogie on that old Heintzman. In the summer of 1967 I bought my first guitar. It was a six string which I bought for $5 from, of all places, the Russian pavilion at Expo 67. While I played it off and on and even formed a band called the "Purple Moss," I never really got serious about playing back then. 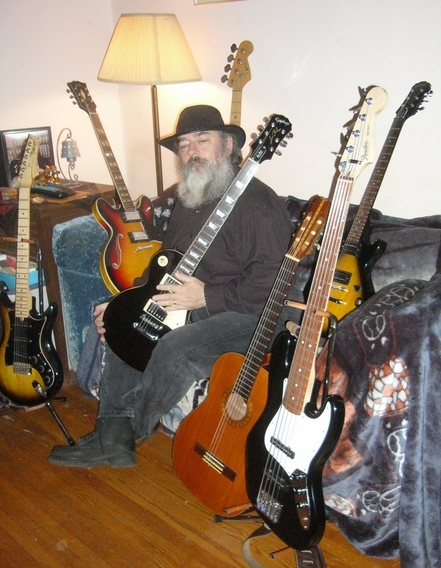 I did continue to play and over the years bought other guitars. In the summer of 2003 I started to play bass with some seriousness. This led to forming The Cain Gang in February of 2005. At first I was the bass player but over time I became the lead guitar player as well as playing some keyboards and harmonica. In 2011 I moved back to bass. In December 2005, I was invited by Lee Van Leer to form a new band called Trill. Lee has been in the music scene for many years, has toured with acts such as the Platters and was the original organist and arranger for Jack London and the Sparrows, a popular Toronto band in the sixties that later moved to the USA and became Steppenwolf. I left Trill in September of 2006 to pursue other interests but occasionally still worked with Lee. In October of 2006 I was invited to join a band called Whoover as bass player. I left that band to pursue other interests but stay friendly with the members. In early 2007 Jeremy Ronson, Voodoo Walters and I formed a new band called Fire in the Greenhouse. That project is currently undergoing some changes as Jeremy and Voodoo have left to work on other projects. In the fall of 2007 I was invited to join a blues band called Voodoo Walters and the Rhythm Method. Eventually I had to step down as I was spreading myself too thin. In 2007 I started playing the piano. I'm no expert but I can hold onto a tune and I don't expect everyone to play in C all night. I have been getting better over the years. In March of 2009 some friends and I started a ZZ Top tribute band called Sharp Dressed Men. In the summer of 2012 we toured the east coast, mainly Newfoundland, as that band as well as H to Oh! and Benny and the Pickups. In May of 2009 I was invited to join H to Oh! as the bass player. Sometimes H to OH! performs as Benny and the Pickups, a country band. In the summer of 2012 we toured the east coast, mainly Newfoundland, as those bands as well Sharp Dressed Men. In 2011 I was invited by Mike Nagoda to play bass on his album "Parliament" We went into the studio in February 2012 to record the album. It was released in May of 2014 by Ropeadope Records. I recorded my parts for the next album due to be released in 2019. In the fall of 2017 I left the band in order to travel. I have always played with Lee Van Leer (originally known as C.J. Feeny) whenever he needed me. In 2014 I officially became his guitar player. Sadly, Lee passed away in January of 2016. I organized a tribute to him which was attended by hundreds of people who knew him over the years. While I have started playing seriously too late to expect to be a superstar in the music scene, I am happy to get out to play. I have found local musicians in Toronto to be very generous with new talent like myself. I have found most of them to be supportive and willing to give me a chance to showcase my playing and help me learn and grow as a musician. In an effort to return some of that generosity, I have obtained and set up the web site Big Smoke Music as a free community online resource for local musicians. I haven't quite decided what I am going to do with it yet but I have a few ideas. Currently all it has is links to some local bands and the start of a weekly jam listing. It also has a database that allow bands to track their gigs and either link to a Big Smoke page for their schedule or use XML-RPC to extract their schedule for display on their own page. I travel now so I have created a couple of Bandmix pages. Here is the one for when I am in Canada and here is my American one. Here is a recording of me playing Sweet Little Angel with an excellent rhythm section, Dale Harrison on drums and Stan Miczek on bass. Thanks guys. Here is a recording of Just My Imagination with H to Oh! featuring me on vocals and bass. Here is a recording of Runaway with myself on guitar and vocals with Benny Sanders on drums and Dylan Gamble on bass. Some other guitar songs are La Grange and Soul Man. Here I am playing Moondance on bass with Bayview Ghost. I also play bass on Back in the USSR, Flip Flop and Fly, Stand By Me and People Get Ready with Michael Keith. Here I am playing harp on Annie Mae's Cafe. For our fortieth wedding anniversary I wrote a song for my wife called It's All Over Now. Here are Some YouTube appearances. The following list shows various dates that I have performed or will be performing either with one of my own bands or else sitting in with someone else. Following that is a partial list of songs that I perform on one or more of bass, guitar, harmonica, keyboard and vocals.